"The Burundi government has approved a limited expedition. So I want you to go in light, stake out a swamp, and bag this crocodile in time for sweeps." Primeval had a rather controversial marketing campaign during its brief theatrical run, with trailers teasing about a film that told the story of the world's most prolific serial killer. It looked pretty dark and ominous, but if you were one of the few that ended up in a theater it quickly became apparent that Primeval was actually about a giant African crocodile that had allegedly killed upwards of 300 people, all loosely based on true events. There really is supposed to be a big croc in the Ruzizi River in Burundi, a mythically large monster dubbed "Gustave" rumored to be 23 feet long and weighing over a ton, who makes meals out of the locals. 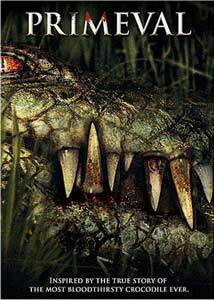 There was a little bit of backlash on that sneaky sales pitch (mostly from those with no sense of humor I imagine), and now with the DVD release the cover art goes overboard in the other direction, and is boldly adorned with a closeup of croc's jaw as well as a tagline that reads "inspired by a true story of the most bloodthirsty crocodile ever." A feature directed by television vet Michael Katleman (Tru Calling, Smallville, Gilmore Girls), Primeval is at its most basic another Jaws variant, because of course that will always be the comparative benchmark for man-vs-animal flicks. Instead of an East Coast resort town and a great white, this time it's a television journalist team�Dominic Purcell, Orlando Jones, Brook Langton�dumped into Africa to get the story on a giant croc that has become the stuff of legend, having devoured hundreds of people over the past decades. Tagging along for good measure is a Steve Irwin-like character (Gideon Emery) intent on capturing the beast alive and a morosely grim captain-for-hire (Jurgen Prochnow) who has other plans. The conceptual wrinkle here is that the area where our intrepid team is sent is rife with "civil war, famine, disease and corruption," which at times make the threat from Gustave seem almost secondary. Violent gun-toting rebels scour the countryside, led by a mysterious warlord known as "Little Gustave", who rules with an extremely bloody hand. And it is this subplot of sorts that threatens to take over the main story, with a number of big action sequences built around our heroes staying ahead of the bad guys, and doing little in the way of croc hunting. Apparently that was considered necessary as a plot deterrent from the usual "later, rinse, repeat" man-against-beast setup, but at one point it started to have the feel of story filler, even as we're start to be inundated with some fairly heavy-handed preaching. I know that 1950s big bug flicks always had a stern "we made this monster" sort of message to deliver, but here it seems just too awkwardly and abruptly presented. The scenes with the all-CG Gustave actually look quite good, with Katleman often opting for some very fast cuts so it is difficult to really see what the heck is going on, which when compounded by being shot largely at night or in the rain makes the presence of the creature look satisfying and presentable without revealing everything. Katleman does offer a variation, with one of the better moments taking place in broad daylight�and believability factor aside�the CG is perfectly silly and thrilling, and is one of those required show-it-all sequences that all giant creature movies demand. Most of the acting and characterization is blandly bland�oh gee, cute love/hate bickering between Purcell and Langton�though Prochnow certainly has a knack for playing craggy and stern rather easily. Orlando Jones steals this one as the wisecracking cameraman, and he gets a constant stream of comically sarcastic dialogue, including two funny gems (one of which involves a proposed method of smuggling a man out of the country and another his extreme dislike of Africa) and the obligatory wink-wink reference to their situation ("Didn't you ever see Jaws?"). Next to the lumbering menace of Gustave, Jones is the standout here, turning the second banana role into the most natural character in the entire film. Even with the obvious Jaws parallels, Primeval exists as a glossy B-grade giant animal movie, mired in a plot that occasionally strays off the main road a few times. Katleman gives viewers a handful of quality kills and genuinely suspenseful moments, but as the plot hits the final act there seems to be some confusion as to what this is really supposed to be about. It's nice to look at, but other than Jones it lacks anything memorable or long-lasting. Image Transfer Review: Primeval is presented in 2.35:1 anamorphic widescreen. The daylight sequences look properly impressive, carrying bright golden colors and a great amount of detail. These "African vista" moments look quite strong throughout, but where things falter a bit is during the frequent night sequences, which suffers from slightly murky black levels and noticeably softer edges. Fine grain is evident periodically, as well. At its best, this one looks very good. Just not at all times. Audio Transfer Review: No complaints at all with the audio, represented here by an aggressively-mixed Dolby Digital 5.1 surround track. An effective use of the rear channels, balanced by a wide presence across the front channels makes for a satisfyingly immersive experience. No issues with dialogue at any time, but the action scenes are where this track sounds best, and elements like massive gunfire and roaring crocs play big and loud. A Spanish 5.1 dub is also included. Extras Review: Primeval is packaged in an embossed slipcase, so if you want to rub your fingers over the slightly raised teeth of Gustave you can. The artwork for the slipcase matches the DVD case art. Director Michael Katleman and visual effects supervisor Paul Linden serve up a commentary track, and the two make a point of mentioning how they worked together in Katleman's kitchen putting the storyboards together. Plenty of on-location-in- Africa anecdotes, including a funny one about the special mud used during the initial attack sequence or that one of the film's most menacing villains was in reality a hairstylist from the Congo. There's a few quiet spots here and there, with Katleman and Linden often elaborating on how certain scenes were trimmed. Crocumentary: Bringing Gustave To Life (09m:38s) is a lightweight-but-watchable EPK piece that for some reason or another doesn't identify any of the participants, so it's up to you to finally figure out which one is Michael Katleman. There have countless "here's how we did the CG" making-ofs, and this one isn't really all that different, though I must confess a festering curiosity to always stare blankly we're shown how all the layers are added together. There's a batch of interesting assorted trailers�however 's controversial "serial killer" is suspiciously absent. The disc is cut into 16 chapters, with optional subtitles in English, French or Spanish. If you don't go into this one expecting a life-changing experience, then I imagine it will deliver most of the required genre staples. Fun to watch, but ultimately rather pointless in the story department, even with the weird attempt at moralizing that goes on here. There's a big croc, a dangerous locale and a solid audio mix that make this an entertaining but hollow diversion. Worth a rental if the idea of a hungry croc flick gets you giddy.